Handwoven Garments and Handwoven Gifts by Aries Weavers! Hi! Welcome to my website! Please take a few moments to look around. I offer a limited selection of weavings here and invite custom orders. 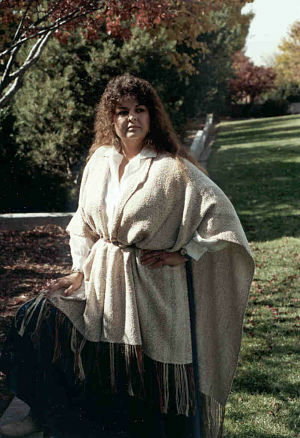 I began weaving in 1983 while working as an apprentice in Carlsbad, New Mexico. The apprenticeship continued for a year before I moved to Edgewood, New Mexico, and established Aries Weavers as my own business. Weaving is one of the earliest crafts; its origins can be traced back many thousands of years. Basically, weaving is a method of creating fabric by interlacing two sets of threads at right angles. The lengthwise threads are called the warp and the second set of threads crossing them are called the weft. If you are looking for rugs, scarves or towels, please visit my Etsy store at http://www.etsy.com/shop/AriesWeavers?ref=si_shop. Copyright © 2019, Aries Weavers - Barbara Peterson.